Reserve Bank of India (RBI) invites application for the post of 19 Officers in Grade B for Department of Economic and Policy Research (DEPR) & Department of Statistics and Information Management (DSIM). Apply Online before 09 August 2016. For Officers (DEPR) : A Master’s Degree in Economics with a minimum of 55% marks or an equivalent grade in aggregate of all semesters / years from a recognized Indian or Foreign University / Institute OR A Doctorate Degree in Economics with Master’s Degree in any subject with a minimum of 55% marks or an equivalent grade in aggregate of all semesters / years from a recognized Indian or Foreign University / Institute. For Officers (DSIM) : A Master’s Degree in Statistics/ Mathematical Statistics/ Mathematical Economics/ Econometrics/ Statistics & Informatics from IIT-Kharagpur/ Applied Statistics & Informatics from IITBombay with a minimum of 55% marks or equivalent grade in aggregate of all semesters / years OR Master’s Degree in Mathematics with a minimum of 55% marks or an equivalent grade in aggregate of all semesters / years and one year post graduate diploma in Statistics or related subjects from an institute of repute; OR (iii) M.Stat. Degree of Indian Statistical Institute with a minimum of 55% marks in aggregate of all semesters / years. Application Fee : Candidates belonging to General /OBC have to pay Rs. 600/- & Rs. 100/- for SC/ST / PWD candidates through the Online by using Debit Cards (RuPay/Visa/MasterCard/Maestro), Credit Cards, Internet Banking, IMPS, Cash Cards/ Mobile Wallets. 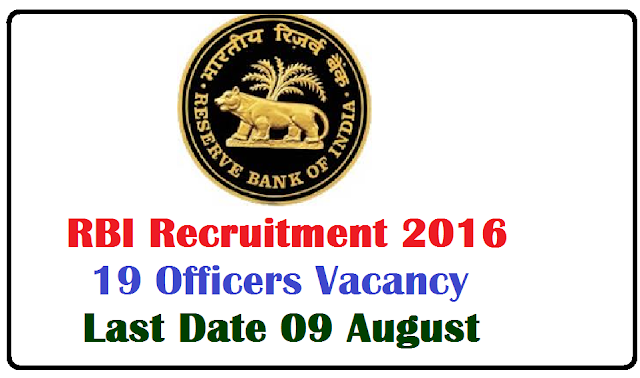 How to Apply RBI Vacancy : Interested candidates may apply Online through the website https://rbi.org.in/ from 19.07.2016 to 09.08.2016.